Welcome to the website of evangelist, musician, singer/songwriter, recording artist Lessie Williams. Lessie Williams is an evangelist, musician, singer/songwriter, recording artist and mother to three musically talented children who perform backup on some of her CD recordings. A native North Carolinian, Lessie grew up in Ramseur, North Carolina, where at an early age, her heart’s desire was to sing gospel. She ministers the gospel through her music and the preached word. She follows the command of Christ to “Go ye into all the world and preach the Gospel to every creature”. Lessie says, “God has taken me many different ways to bring me full circle into an evangelistic music ministry”. 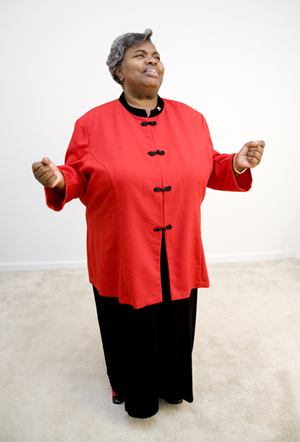 Lyrics and music written by Evangelist Lessie Williams can be heard on her latest CD entitled “God Changed Me in Time”; as well as, on three other titles – “Jesus Is My Everything”, “I Made It Over” and “Jesus Is Mine”. Bernard Sterling, backup singer for Pastor Evangelist Shirley Caesar says, “Lessie Williams is a great singer with feeling and soulfulness, and she has the anointing of God.” Loretta Ragan, who produces lead sheets for Lessie says “Her in-depth feelings are expressed quite profoundly through her lyric content and musical rhythms.” She sings, plays piano and preaches throughout the states of NC, GA and TN, as well as, anywhere else God calls her. Lessie is also willing to travel internationally when and if her ministry is needed. She recently spoke and sang at the United Methodist Troy Conference Commission on Religion and Race worship services in Schenectady, NY and Winooski, VT. These services brought together diverse groups from the African Methodist Episcopal Zion, African Methodist Episcopal and United Methodist churches in the United Methodist Troy Conference region. She has previously performed at the Diana Wortham Theater in Asheville, NC and at the Valleytown Cultural Arts Center for Chautauqua AVE! (Andrews Valley Experience!) and the United Methodist Church in Andrews, NC. More recently, Williams has ministered for the Waynesville Missionary Baptist Association Retreat in Hayesville, NC; preached a revival at God’s Holy Tabernacle in Sylva, NC; and a revival at the Church of God of Prophecy in Norman, NC. For direct contact: Call 662-276-3096; or email her at lessiewilliams12@att.net. February 28, 2000 Front page feature – “On a Song and a Prayer: Pastor Wants To Bridge Racial and Religious Divides” by Kathy N. Ross, staff writer, Enterprise Mountaineer, Waynesville, NC.